No, the Brammo Empulse electric bike doesn’t make a nice noise like a howling Triumph triple engine or a booming Ducati V-twin. If that’s what you’re after in a bike, then an electric machine, Empulse or otherwise, is not for you. But there’s more to a motorcycle than the noise, otherwise they’d just be really big musical instruments. Electric bikes are here. They’re putting in impressive laps at the Isle of Man TT, the cost of production models is falling and their performance is now in a range where we can compare them to the gasoline powered bikes we all know and love. So rather than ignoring them, we’re giving them an opportunity – if they can excite and entertain us like a petrol bike does, they’re in. If not, they can bugger off back to the future, and take their flux capacitors with them. Pretty? Hmm, Ducati has nothing to worry about, but the Empulse is a cool looking thing. I’ll admit, until recently, any talk of fuel crises or electric vehicles being the future had me pouring unleaded down my ears and making neoww noises until the horrible words went away. I am a fully signed up petrolhead. I love the smell of an engine, I love working on them, I crave the sound, the feel of a motor giving its all and firing me at the horizon on a heady blend of oxygen and liquefied dead dinosaur. I don’t know if the fuel will one day run out, I don’t know the best solution to transport in the future. But what I do know is that anyone trying to make sure that in fifty years time we can still do skids and wheelies for fun deserves our attention for five minutes. 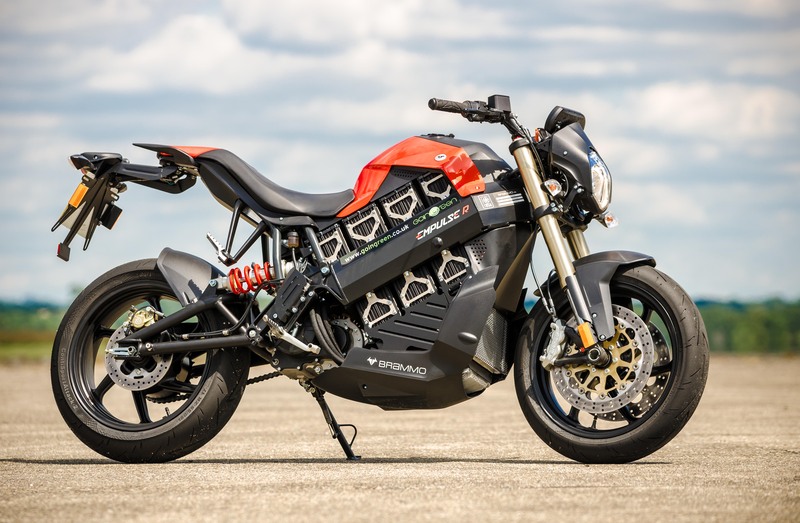 Enter Brammo, an American company designing, building and distributing electric motorcycles. Not a couple of prototypes. Not a small batch of super-expensive garage ornaments. But motorcycles built for mass production, that just happen to be powered by a stack of batteries rather than a tank full of unleaded. 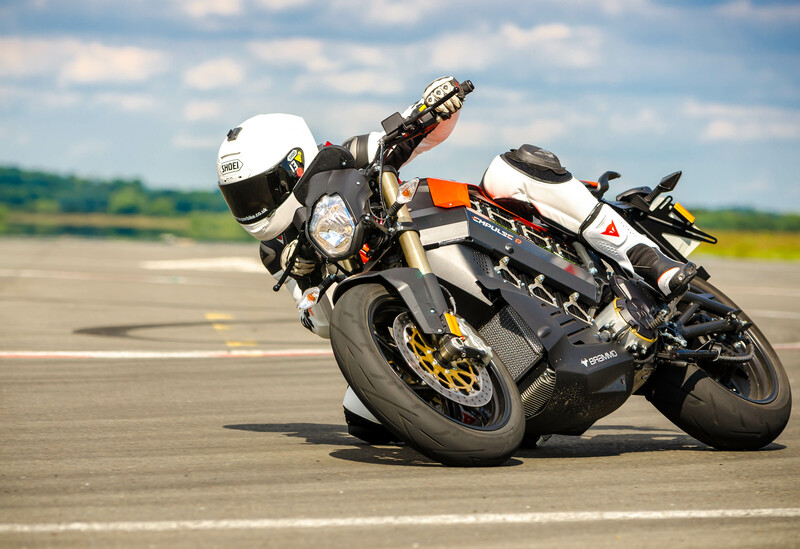 They’ve got a few models in the range, with a city bike, a race bike, a police bike and this sports bike, the Empulse R.
First impressions are pretty powerful, and the Empulse scores a win with us from the off. We’re not in to hippy new-age tree hugging styling – electric or otherwise, we want something that looks and feels like a sports bike. Solid, inverted telescopic forks – check, radial four-pot Brembo brakes – check, proper sized sticky sports tyres – check. There’s a rev counter, a clutch lever, a gear lever and all the normal controls in the places you’d hope to find them. Plenty of electric bikes go all-out to be different and start an E-revolution, but most of the time they just end up alienating you. The Brammo feels so much like a normal bike, you find yourself thumbing the start button and wondering why it isn’t making any noise. You turn on the normal ignition key, press and hold the normal start button and, just as you’re waiting to hear a starter motor whirring, the needle sweeps around the dash to let you know it’s on. Pull in the clutch (you don’t actually need to but old habits die hard), click the gears down from neutral and find the only real oddity with the Empulse – neutral is between 2nd and 3rd. I don’t know why, but it’s not that unusual – I have a classic Italian bike with a neutral between 2nd and 3rd. And another one between 3rd and 4th. And one more where sixth gear used to be. See, completely normal really. I pull away, slipping the clutch, pin the throttle and immediately swear at whoever wrote the spec manual for lying. The Empulse only claims to have 54bhp, but the drive and torque off the bottom end belie the modest peak power figure. The Empulse has two different riding modes – in normal mode it’s smooth, sedate and offers brisk acceleration. In sport mode it charges off like an over-excited Scalextric car. The straight-line performance isn’t going to trouble a superbike, but it would give an ER-6 a run for its money. With no vibrations going on and only a whirr from the motor, the sensation of speed is definitely more than on the equivalent gasoline bike. And then I click up through the gears and charge off at the horizon with the bike whirring away beneath me. No, there’s no glorious soundtrack of spinning pistons and bouncing valves, but what surprised me was how little I actually missed it. Getting your chinstrap caught on the front brake lever is always annoying.